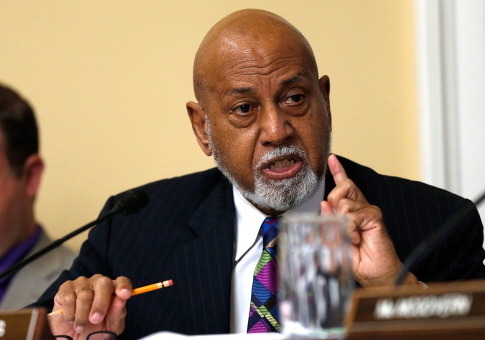 Democratic representative Alcee Hastings (Fla.) has officially brought a convicted money launderer onto his full-time staff after paying the individual for "part-time" work over the past several years. Dona Nichols Jones, who has received compensation from Hastings since April 2014 for what was listed as "part-time" employment as an aide and community liaison out of his Palm Beach County office, is now listed as a "staff assistant" in his office, Legistorm filings show. The FBI announced in 2011 that the Joneses had been convicted in a scheme to defraud a lender after Mikel had taken out a business loan for the purpose of financing a Philadelphia law firm that he owned by securing a multi-million line of credit from New York-based Stillwater, a lender, and agreed to use the funds for only legitimate purposes. Instead, the couple established a shell company and created fake invoices to steer money to themselves and falsely claimed that two companies—one of which they owned—provided services to Mikel's firm that never occurred. Once the Joneses had redirected the money to themselves, they used it for the likes of paying off credit card debts and buying Philadelphia 76ers tickets. The couple also laundered $160,000 through Dona and her daughter's bank account to replenish money that had been taken from Mikel's law firm trust account. From 2008 to 2009, the Joneses had siphoned $350,000 worth of funds by using fraudulent invoices. Mikel Jones was convicted on 30 counts of fraud and fired from Hastings's office. Dona Nichols Jones was convicted on conspiracy, money laundering, and 14 counts of wire fraud and ultimately paid $400,000 in restitution while serving one day in prison. Hastings first added Dona to his office's roster three years later. Hastings's office did not respond to an inquiry about Dona Nichols Jones by press time. In addition to Nichols Jones, Hastings for years has paid his longtime girlfriend, Patricia Williams, the maximum congressional salary to work out of his Broward County, Fla. office, the Free Beacon previously reported. Williams is paid more than the congressman's Washington, D.C. chief of staff. The Foundation for Accountability and Civic Trust, a right-leaning D.C.-based watchdog group, filed an ethics complaint to the Office of Congressional Ethics over the payments. The group additionally added Hastings to their top five worst ethics violators of 2017. Williams served as co-counsel for Hastings during his impeachment trial as a federal judge in the 1980s after Hastings was charged with "conspiracy and obstruction of justice for soliciting a $150,000 bribe in return for reducing the sentences of two mob-connected felons convicted in Hastings' court." Hastings was acquitted in 1983 but a later probe found that he had tampered with evidence, conspired to accept bribes, and committed perjury. Hastings was removed from the bench in 1989 by the U.S. Senate, which made him the first federal judge to be charged with a crime while sitting on the federal bench. Hastings also employs Williams's daughter out of his Broward County office as a staff assistant. This entry was posted in Politics and tagged Alcee Hastings, Florida. Bookmark the permalink.